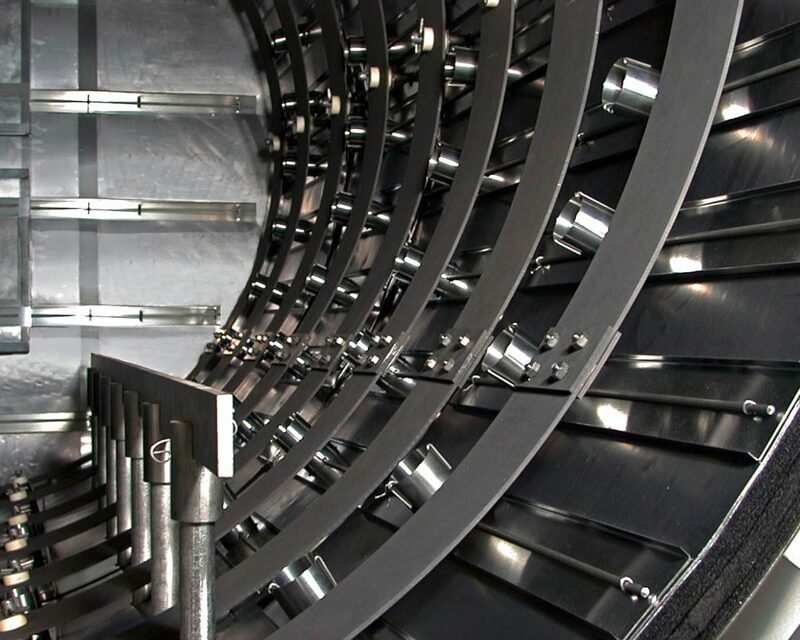 The Thermal Processing Divisions of VAC AERO International have provided repair services for damaged components from land-based and aerospace gas turbine engines. Engine manufacturers, operators, overhaul centers and commercial airlines are just a few of the customers that depend on these services. Many hot section engine components are fabricated from nickel-based superalloys. These materials cannot be repaired by traditional techniques, such as welding, without causing significant reductions in mechanical properties. As a result, VAC AERO developed proprietary vacuum brazing techniques to repair cracks, wear and other service-induced damage. Figure 1: Typical graphite felt insulated hot zone. The extent of damage to the engine components is often severe. Therefore, the brazing process involves the use of large amounts of brazing filler metal to make the necessary repairs. When subject to high temperature under vacuum, volatile metallic and organic constituents vaporize from the filler metal. While a portion of these volatiles is removed from the furnace chamber by the vacuum pumping system, the balance tends to condense within the chamber, much of it depositing on the hot zone insulation. In addition, excess molten braze alloy occasionally drips from the workload onto the heating elements and insulation, despite the use of drip trays. These deposits can have a detrimental effect on the performance of the furnace. As a manufacturer and user of vacuum furnaces, VAC AERO needed a hot zone design to withstand these aggressive brazing applications. Many nickel-based superalloys contain alloying elements like aluminum and titanium that form stable oxides in the presence of moisture or other contaminants in the brazing environment. Oxides inhibit the flow of the filler metal making the superalloy particularly difficult to braze. Traditionally, vacuum furnaces used for brazing of superalloys were built with all-metal hot zones insulated with layers of molybdenum and stainless steel sheet. Because metal insulation does not readily absorb moisture or other contaminants, it was considered the only type of insulation that would provide a suitably clean environment for processing difficult to braze materials. Graphite insulating products were eventually developed as a more economical alternative to metal insulation but were considered too “dirty” for brazing exotic materials like nickel-based superalloys. VAC AERO decided to evaluate the performance of graphite insulation in difficult vacuum brazing applications. Through production experience, VAC AERO had determined that all-metal insulation does not stand up well in aggressive brazing environments. As condensed metallic constituents from the brazing filler metal build up, the metal insulation begins to curl and crack due to differential expansion between the insulation and the deposit from the filler metal. This eventually causes a deterioration of the hot zone’s insulating properties. Metal insulation is also particularly vulnerable to braze alloy spillage. Molten braze alloy will often dissolve metal shielding, leaving holes through which heat can escape. The use of thicker sheet and special molybdenum alloys in the insulation will extend the life of an all-metal hot zone, but also add considerable expense. A typical insulation package using graphite felt is shown in Figure 1. Compared to metal insulation, the felt is more economical and easier to fabricate and maintain. Because the felt is not reflective, an inner layer of reflective material, such as graphite foil, must be added to enhance the radiation of heat within the furnace. Graphite insulation is also available in the form of rigid graphite board with a bonded reflective layer. However, tests showed this product to be much more time consuming to fabricate and it often suffered fretting wear at the joints that eventually created gaps in the insulation. Regardless of the form, VAC AERO’s tests confirmed that a well-maintained hot zone incorporating graphite insulation can be used to successfully join difficult-to-braze materials such as nickel-based superalloys. While there is little doubt that graphite insulation is more likely to absorb moisture than metal insulation, regular burn-out cycles will rid the insulation of moisture and contaminants that are detrimental to the brazing process. Figure 2: Graphite insulated hot zone remains intact after five years of high volume production brazing. The only disadvantage of the graphite felt and graphite foil combination proved to be the durability of the graphite foil layer. The foil tears easily and has a limited life when gas quenching is turbulent, such as at higher quench pressures. VAC AERO overcame this problem by replacing the graphite foil with a foil-bonded carbon composite inner layer. The carbon composite is flexible but very strong and resistant to tearing. It is bonded to a reflective foil face that provides excellent heat radiation. Figure 2 shows a hot zone in a VAC AERO production furnace constructed with graphite felt insulation and carbon composite after almost five years of daily use in aggressive brazing applications. While the hot zone has a heavy build-up of metallic deposit, it remains completely intact and the furnace regularly qualifies to the most stringent pyrometry standards. The photograph also shows the durability of the lightweight curved graphite elements used in VAC AERO vacuum furnaces. Though braze alloy was spilled on these elements, there was no deterioration in performance. VAC AERO’s tests confirm that a well-built hot zone incorporating graphite insulation can be used as a more durable and economical alternative to traditional all-metal designs in even the most difficult vacuum brazing applications.